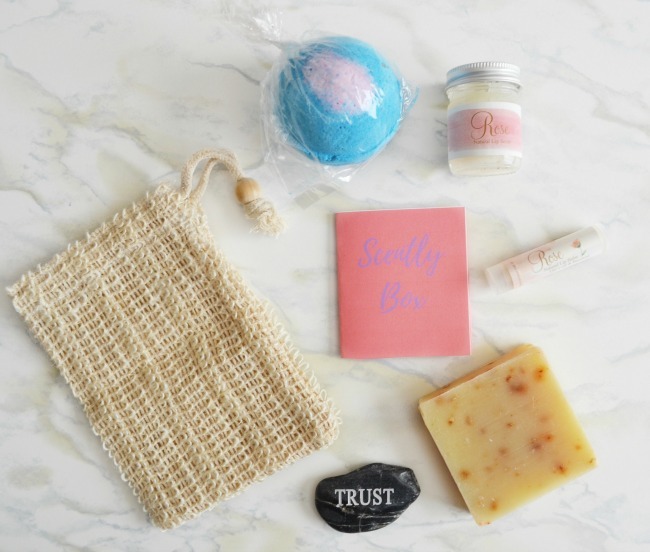 If you remember a little while back on my Instagram I made a post about a great subscription box filled with homemade bath and body goodies. I have to say that Scently Box is one of the best subscription boxes I have ever gotten! Everything is either handmade by Beverly, the owner, or she partners with other small handmade companies to curate beautiful and thoughtful boxes. Beverly also tries out each and every product to make sure it's worth sharing in Scently Box, which I think is such a great thing! It means she is super knowledgable about how each product works, feels, smells, etc before sending it off to her lovely subscribers. Also, stop me if I'm talking to much about how awesome Beverly is, she is such an absolute sweetheart and really wants to make these boxes something people will truly love. Scently Box has three subscription size options: Mini, Mod, and Ultra and has a surprise scent theme for the month. The mini subscription has 3-4 items, the Mod 4-5, and the Ultra 5-7. You can also decide whether you want to purchase each box individually or set yourself up for a three month or six month subscription. I received the September and October Ultra boxes and am still obsessing over how awesome the products are. I wasn't exactly sure what I was expecting when I opened up my boxes, but whatever my expectations were, the boxes definitely blew them out of the water! 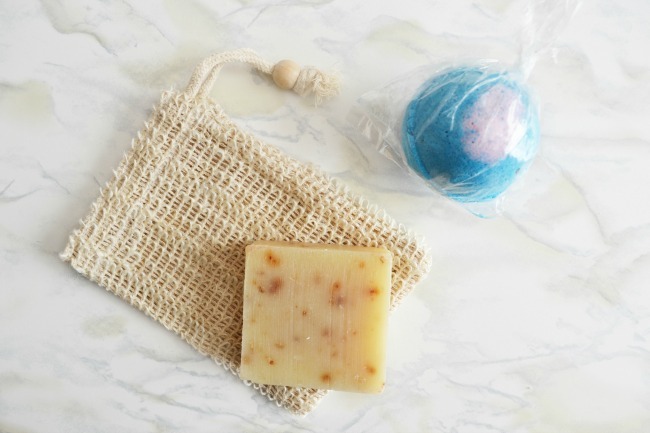 I love bath/body products, and probably hoard more than I need, but you just can't get better than homemade goodies. All the ingredients in these boxes are made with ingredients I can look at and understand what they are, nothing long and chemical sounding like other similar products! The September box was rose themed and I was so excited! Roses are one of my favorite flowers, and their scent always make me happy and relaxed. 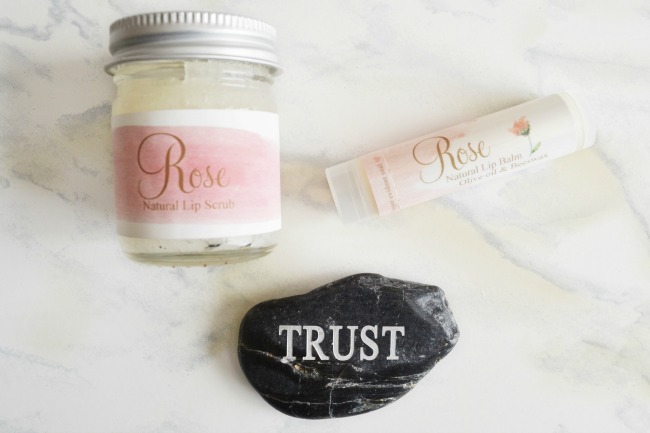 A few of my favorites from this box were the Hydrangea Rose Goat Milk Soap and the Rose Lip Scrub and Lip Balm! I've mentioned multiple times on the blog how much of a sucker I am for a good lip balm. This one is so moisturizing, and man does it smell good! Well, let's be honest, the whole box smells amazing. I have to say that I personally loved the Lavender Box more, and it may or may not be because there were so many cute items in this box! 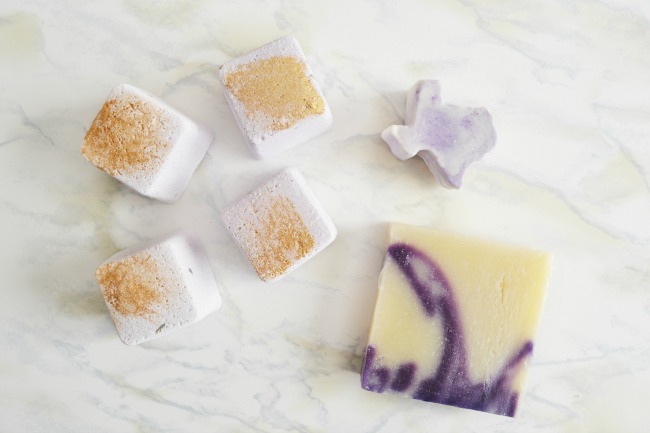 I mean honestly, how adorable is that Texas-shaped soap?! 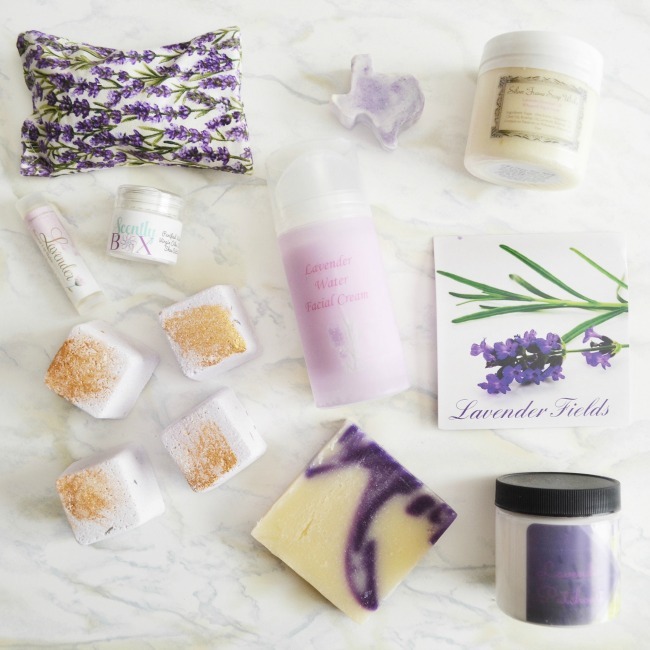 A few of my favorites from this box include the lavender sachet which I'll be sticking in one of the drawers in my closet to make it smell nice and flowery, the gold-dusted mini bath bombs (with real lavender inside! ), and the Lavender Water Facial Cream. I actually really love the facial cream because it's so light and moisturizing without making my face feel greasy or wet, something that I definitely appreciate! Also, I love how Beverly is so generous with her boxes and strives to make her clients happy. This Ultra box had 10 products in it even though the average is 5-7, such an awesome surprise! I've been raving to everyone about these boxes since I got them, and my roommate even ordered a mini subscription for herself because the quality of the products were just too great to pass up! I highly recommend getting these for yourself or for a friend, especially since the holidays are right around the corner! The December subscription is open now until December 5th. (So it will get to you by Christmas!) You can order your subscription on their website here. And be sure to check them out on Instagram as well! What's your favorite product from the boxes? Also what are your favorite bath/body scents? This post was sponsored by Scently Box. All opinions are my own, thank you for supporting the brands that make The Classic Brunette possible! How have I never heard of this before?! It's everything I've ever wanted in a subscription box. Definitely going to sign up soon! I have seen so many subscription boxes (mainly for hair or fashion) but nothing like this one before. I really dig the aesthetic of it all and that everything looks so pretty. Gotta check em out for myself now so thanks for sharing! I LOVE this idea!! Need to check it out! I have always wanted to try a bath bomb! This is such a cool box! This is such a cool concept! I know a friend that would love this :) And you're right, that Texas shaped bar of soap is the cutest! That October box looks like it was MADE for me. I love Lavender! I am a lavender lover! this is so amazing, thank you so much for sharing, love! Oooh I love the idea of these boxes! The lavender one looks so nice! I still haven't tried a bath bomb and I'm so upset by it! This sounds like a great box to give some cool products a go! Both of these sound awesome! I love bath bombs and anything rose scented is good in my book! I need to try this! I love using natural beauty products! I haven't done subscription boxes because usually they've filled with things I'm not interested in. But I'm so glad you did this review on the Scently Box. Love that everything is homemade. This the cutest thing ever! I would definitely love the rose scented products. These looks like the best products to unwind. Love them all! Both my Mom and I are very sensitive to scents since a lot of scents give us headaches. I mainly stick to vanilla or peach scents. These boxes are really cool that they are filled with homemade goodies. Oh, wow! I love the boxes included in this review! :) Thanks for sharing. These sound fantastic!! 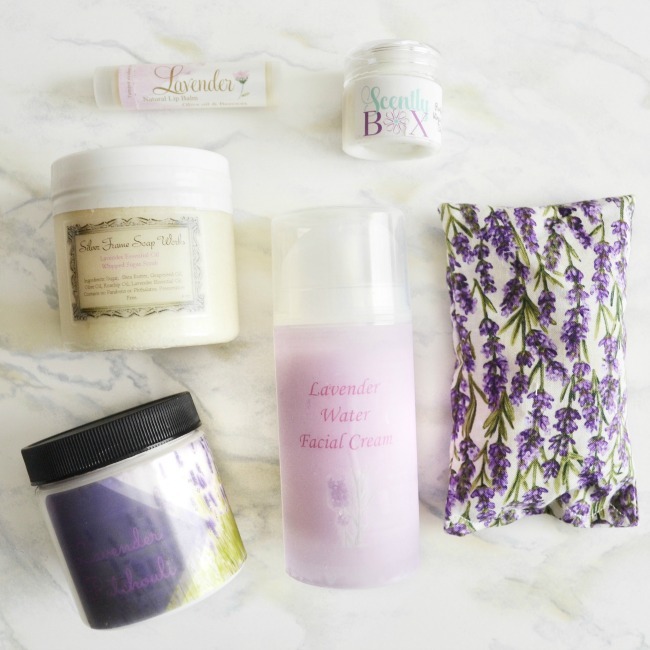 I'm really not a big fan of lavender scents, but the packaging of these products are beautiful! Omg all of this stuff looks amazing! I want to try it all. This particular box sounds awesome; lavender is the best. The sachet definitely sounds interesting and something I'd love to try. I love homemade products as well! !